Kraftwerk‘s ‘top of the range’ four-disc blu-ray box set edition of 3-D The Catalogue, which delivers 436 minutes of video/audio in a 12-inch deluxe book edition is now once more available to pre-order at a great price. This set comes with a 236-page hardcover art book. Two blu-rays cover the album performances, the other two discs contain tour films and projections. Everything is 3D, but compatible with standard 2D. These all have 5.1 audio too, and you can enjoy Dolby Atmos too, if you’ve got the right kit! The blu-ray box of 3-D The Catalogue is issued on 26 May 2017. Amazon UK’s price of £104 is significantly cheaper than anywhere else. For US fans that’s around $112 plus shipping, a massive saving when compared to the $200 price-tag Stateside. Discs are region free and PAL/NTSC compatible. Just a note to people that bought the German CD set. Radioactivity on disc 2 is the English version, but on disc 7, with the Mix, it is the correct German version. When I say “a few more live shots or 3D images” by the way, I meant in the book, not on the Blurays!!! Thank you Auntie, this is unbelievable, i bought the recent Pere Ubu box and the HD downloads for the 4 LPs were incredible 6 GB !!! Now that’s quality. I couldn’t decide till the last minute if i wanted the 9 LP Box or just the CD Box by Kraftwerk. Now i’m happy i did buy the CD Box. I’ve read that the downloads for the vinyl box are only mp3 ? Is that true or what quality are they? Regarding download codes, if they don’t work you are entitled to ask for replacement codes/or your money back. It’s the Bank Holiday but hopefully things get sorted out. I’ve also got the issue with the download card…I’ve contacted Warner Customer Services but heard nothing back. Thanks Anutie Sabrina. My mate tried my disc on his machine and his computer and it played fine. I’m confused and unsure what to do. Thank you drdig for your review, well appreciated in spanish as I’m from Mexico ;) I’m now very happy I bought it. As soon as Paul re-published the £103 deal I hit the button (total 90£ shipped!) Eagerly waiting for my box after your review! Thanks both (Paul, drdig)! The Link on the card with Vinyl Box is http://redeem.warnerartists.net/Kraftwerk3D but does not open? anyone else the same problem? Hi can someone post the link here where I can redeem my download code that comes with UK vinyl box of Kraftwerk 3D The Catalogue. The Link on the card with mine does not appear to open? Has anyone had any problems with disc 1 of the concert blu-Ray’s? Mine won’t play, even after a firmware update. I really don’t fancy returning the whole box set to Amazon. if anybody is interested in the German cd box- this is currently at 35 euro on Amazon de….with postage to uk its coming out at £36.55 – quite a saving on the English version ! My Amazon order for the bluray box set has been dispatched. Wahey!! Can you post a link here to your review when you do it (so we know it’s your review), would be very interested to get your opinion, thanks. It’s back on Amazon UK. Up to £133, but I’ve pulled the trigger as I had a voucher to use and it’s not a bad price compared to the other options. And Amazon do their pre-order price guarantee anyway so if it drops in price again this week I’ll get the lower price. Phew. Bloody hell, £934! I hope the seller knows they are responsible if the set is faulty, lost or damaged in the post. The post office will only pay limited compensation too. Man alive, it’s gone again (and currently showing as available from another seller for £934.15!). I’m going to have to keep checking the Amazon UK site every couple of hours this week… This is painful. Yep that’s true Paul – so i decided to order The Catalogue on Blu Ray and Der Katalog on CD , this way i have both versions (if there are different versions?). I will listen more to the CDs anyway. And if they are the same, well, Amazon UK has/had the best price for Blu Ray, so i can only win. Really? How do you know that without asking them? I imagine if they are selling both versions they will have a pretty good idea. Asking them might save people posting the same query ad infinitum. Oh yeah! Why didn’t I think of that? My feeling is that the packaging will be different for the german version definatly, the discs more than likely are the same. Kraftwerk played Berlin so maybe some of the tracks are in german. They also played Paris, so possibly some tracks are french. As we fans know, some german, french and indeed spanish versions of songs do exist. amazon.de lists the german versions clearly as Deutsche version, and the mp3s there also which you can play a sample of there are in German. I prefer Kraftwerk in German so I ordered the German versions. JPC doesn’t know things like this, you will not get a satisfying answer from them. If we would write to Warner we would not get an answer – if Paul would ask Warner, he would get an answer and we all would know if there are two versions. … so, I suppose that’s an indication that Der Katalog, at least, will contain the German versions. The listing for The Catalogue shows English song titles. Why don’t one of the people who’ve posted the language query just email jpc.de and find out from them? Mat, the blu-ray product description confirms it is all regions (Alle Regionen), but I cannot see any information on the language. Maybe certain songs are in german? The DVD version will be NTSC rather than PAL so as to be compatible with US players/TVs. Anybody knows if abridged BR+DVD version sold in Germany will be in German? Will it be all-region NTSC? Is the 3D Blu-ray set a limited item? This link from warner germany indicates a german language version. I ordered both sets. English and german. Amazon.co.uk’s price for the Blu-Ray box has been going up and down like a rollercoaster, but today (12th amay), while the price was at a reasonable low, I preordered it. Available for the £104 again, grabbed it! Apologies as it’s off topic, anyone else wonder if they are playing Glastonbury? Surely there is some way by now to establish if there are german sung versions of these? Can’t someone just phone the record company? Paul? From the above comments looks like there are others would like to know too. I think someone has already made the point that depending on where each album / track is performed will have an impact on what language they sing in. There aren’t two versions of this box set. Thank you Paul for clarifying. After sporadic availability I glanced at my saved Amazon UK page on my phone today and saw the Blu-ray set was available again, and took the plunge. Taking off VAT and for a meager £3.08 postage to the USA, final total was £89.92 or about $116 delivered. It was a choice between this and Sgt. Pepper Deluxe this month but I figure the Sgt. Pepper will be available for a much long time. After the original Catalogue set seemed to go out of print quickly, I figure I shouldn’t wait for this to disappear too. Looking forward to reexperiencing some of what I saw at the 3-D concert in Boston in October 2015.
close to backing out and going some where else. Relieved to say the least having pulled the trigger early. Now cannot wait to get my mits on this as the download I bought of the Robots track does sound bloomin awesome. Thorsten, that is correct. If you cancel or return the item you WILL be charged for the mp3s. Äh, yes, but only in the UK – i ordered and it says: mp3 only for UK! So if you live outside UK you will not be able to listen/download the mp3s. Brilliant, thanks @ Auntie Sabrina! Blu ray version back in at Amazon as of 14:06 – for £104 pre-order price!! Just in addition to the above, I loved the days of Mini-Disc, plugging the recorder into a TV/DVD set up and making my own ‘live’ albums of concert DVDs without having to buy the CD, or recording Glastonbury highlights directly off the telly! Just put in my order thru Amazon UK…. thanks for providing the link and heads up on the fantastic price. It would be really handy if someone could point to anything definitive they find about different language editions (ie German) as many would prefer it, if there is a choice. Missed it last time, grabbed it this time. Ta muchly. 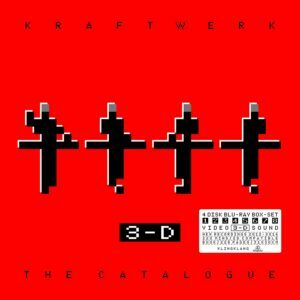 Just discovered: the german shop SATURN/MEDIAMARKT who sold the exclusive Depeche Mode Box have “German Language Versions” of the 3-D Katalog for CD,Vinyl and Bluray. I wonder if that is correct information? Haven’t seen that anywhere else. Yea, it’s $199.99 through Amazon US. Too bad. I’ll assume it will come down at some point. oh my god i missed this, do you think this price will come around again paul? Parlophone is part of Warner Music now anyway. Der Katalog, I should say. Amazon de is offering both The Catalogue & Das Katalog which leads me to believe they will be different. I can see where confusion over Gernan/English versions might arise. The Catalogue box of studio albums came in German & English versions (although only 5 of the 8 albums actually differed). Personally I like the German versions best even though I am not a linguist. To me they just sound better. I have ordered the bluray & Cd box sets but would be interested if German versions existed at some point. Are there now a German version and an English version or is there only ONE version ? This is still confusing for me as I want a German version. There’s only one version, as far as I’m aware! Still don’t see how even 103 or whatever is a good price. That’s over 25 quid per disc. The only decent deal is the CD set. Yeah, I’m convinced the big box and book are there simply to pump up the price. Without those, this should be maybe $80 or so. 436 minutes or 7 and a half hours in total, so roughly half of this means about 3 hours 45 minutes then..? Is it correct what I ordered? Yes. You’re clearly outside the EU so £86 is the same as £104 with VAT. Can I please ask, does anyone else wonder if the 207 track list for the (sold out) blu-ray set is a bit misleading? Are some of the tracks the same with differing soundtrack options (5,1 mixes, stereo etc)? No, you’re right, it’s very misleading. You’re basically getting each album performed live, and the number of tracks just show the different soundtrack options. It’s not nearly as sizable as it appears when listed like it is here. Oh–well, each album performed live on discs 1-2, and then those same songs showing just the screen projections on 3-4. Still. I’d kept checking Amazon US for the Blu-ray, but it was never there. Now it is, and is listed at $200! No way is this worth that. I’ll wait, or seek out a cheaper international vendor. I bet few people buying this will ever listen to all 250+ tracks! £139.99 for the 9LP set from Amazon UK. Yes, unfortunately it appears that Amazon have sold out again and made it ‘unavailable’! I’d ignore that £183.. it’s a third-party seller. GBP 89.91/USD 121.03 including shipping to New York City. Thanks, Paul! FYI, its back up to £183.58. Are these new live recordings in surround or the original analog album masters remixed to 5.1? Live performances – audio and visuals. In 5.1 and 3-D etc. Still can’t work out how vinyl works in 3-D or 5.1 ! The vinyl is a 3-D object itself. I was fretting about not finding this for a decent price, and now it’s pre-ordered for US $121 delivered. Savings over buying from Amazon in the US was considerable. (Hope this favorable US$/GBP exchange rate continues for a while.) Definitely the fastest I’ve ever responded to a Deal Alert. Seeing as I`ll be attending a few festivals in the USA in the next two years I hope the £/$ exchange rate becomes most unfavourable for you guys in The Colonies. I think the German link above is wrong. It is pointing to the abridged version, hence the price. But it states that it is 4 discs and a 12″ x 12″ book. So that will be my claim. I took a chance and ordered that one. Just re-ordered the Blu Ray box set. Amazon have waived the delivery charge because of the confusion in respect of their previous listing and it will be with me on 26 May for £104.20. I have the new OPPO UDP-205 arriving in a week or so and The Catalogue 3-D will give it a good work-out. The Catalogue / Der Katalog 3-D Blu Ray box is also available from Kraftwerk’s own Kling Klang Konsumer Produkt site and includes a T-Shirt. It is €185.00 though. The eight album vinyl and eight CD box sets are also available. I’d be interested in a 2-blu ray set for the 3D and 5.1 mixes. 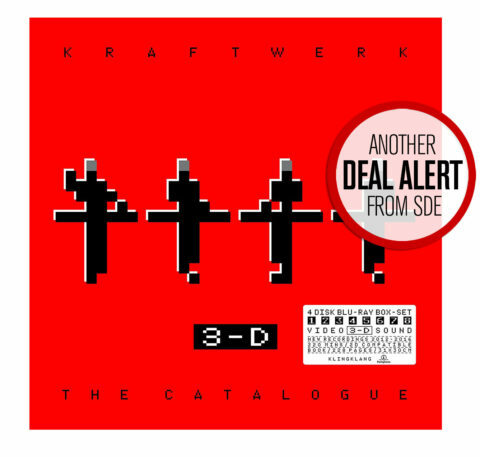 I’m not a Kraftwerk fan but I’d sure get just the blu ray set…..